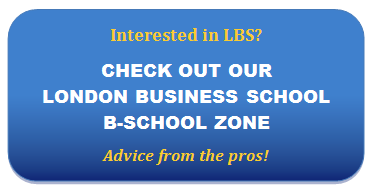 The set of essays for the LBS Masters in Management program is comprehensive – it’s work, requiring serious effort and thought to answer really well. Yet that comprehensiveness is also a ready opportunity for you to effectively portray your distinctive candidacy. It’s important to view the multiple questions as a “whole” and use the range of topics to illuminate different dimensions (qualities, interests, talents, skills, etc.) of your profile that are relevant to the purpose at hand. Note the emphasis on what you’ll contribute, which is directly or indirectly referenced in various questions. Keep in mind that the adcom is looking for people who will excel not only in the program but also post-graduation as a young business professional. In what industry, role and where (companies, locations) do you see yourself working immediately after graduation from London Business School? What motivates you to join this industry and how will your academic, professional, and personal experiences help you achieve this career goal? What is your alternate career plan? How will the Masters in Management contribute to your personal and professional development and why is this the right time for you to pursue this degree? This detailed question actually gives you a structure; I suggest developing the essay either point by point following the specific questions or possibly presenting you motivation for the goals first – it can work either way. In discussing motivation, mention not only things that are enriching to you, but also ways you hope to make an impact in that early career step, how your work will benefit other people and/or the company and/or society in some way, etc. For the alternate career plan, also briefly explain why it’s a viable path for you (but keep discussion of this alternate relatively short). Where do you see your career progressing five years after graduation from London Business School and what is your longer term career vision? Obviously this essay should build on the previous short-term goals discussion. Note the mention of your “career vision” – think of this as the lasting impact you want to have, what you’d like your career legacy to be. Integrate that vision with some concrete prospective plans. Based on your experience of working in academic or professional teams, please describe a couple of recent examples when a challenge or conflict affected the dynamics of a group you were a part of and the outcome of these situations. Please detail the specific contributions you made, either as a leader or member of these teams. Given these experiences, what role will you play in your study groups during the Masters in Management programme? This essay asks for a lot of information in just 500 words. First, select your two stories, ideally from different contexts. If possible, try to find one where you’re a leader and one where you’re a team member, to demonstrate your experience and capability in both roles. Next, tell the stories in consecutive order. Don’t lose sight of the core question, how the challenge or conflict affected the dynamics of the group. I suggest detailing you contributions as you narrate the stories. In addressing how these experiences will influence your role in the study groups, be as specific as possible to further show your understanding of the needs and dynamics of teams. Active involvement in our community is an integral part of the Masters in Management experience and expected of all students on campus. Which role do you see yourself playing in the life of the School and how would you concretely support the student community during your studies? Which professional, regional, sports or social clubs would you engage with and why? How would you plan to stay involved after you become an alumnus/alumna of the School? This essay allows you, among other things, to showcase some of your interests. Remember: LBS values well-roundedness. Presumably you’ll continue certain activities that you’ve enjoyed so far, and so research the school’s offerings in those areas and discuss your plans to participate, citing your previous experiences. It’s fine as well – indeed advisable – to mention new interests you’d like to explore. But grounding the whole essay in activities you’ve never done will end up not being credible; better to spend more time on how you will extend or continue enduring interests. Finally, discuss 1-3 specific ways you’ll stay involved long-term. What will be your biggest contribution to the Masters in Management class? In answering this question keep in mind answers to questions 3 and 4, which also discuss your contributions. The key to this essay is selecting the best topic. There is no one single best formula. For one person it may be a unique skill or talent, for another it will be a valuable experience or perspective. Whatever you choose to discuss, ground the essay in anecdote and concrete experience. So if you’re discussing a talent, say creativity, portray it through examples. Doing so will make the answer credible, vivid, and memorable. Are there any other pieces of information that you have not mentioned elsewhere and believe would help the Masters in Management Admissions Committee in assessing your candidacy for the programme? This question invites you to present new material that will enhance your application, as well as to explain anything that needs explaining (e.g., academic glitch, gap in education, etc.). As far as non-necessary points, keep in mind that if you are making the adcom read more than is required, there should be a clear value to the information you’re sharing. By Cindy Tokumitsu, author of numerous ebooks, articles, and special reports. Cindy has advised hundreds of successful applicants in her last thirteen years with Accepted. Last updated on February 6, 2013.